Liberal Appellate Court Judges today ruled that President Trump’s proposed travel ban is illegal because of their perceived belief that the President is bigoted against Muslims due to his previous statements. 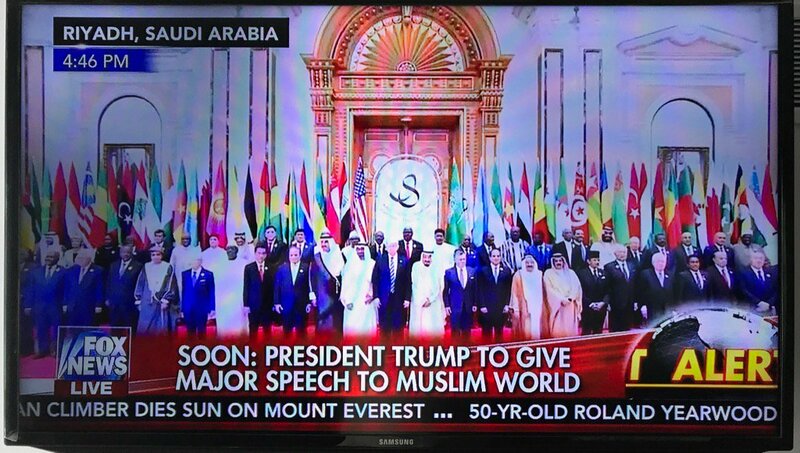 The liberals completely disregarded the fact that President Trump just stood with 50 of the world’s top Muslim leaders in Saudi Arabia in unison against terrorism! “speaks with vague words of national security, but in context drips with religious intolerance, animus and discrimination,” a federal appeals court said Thursday in ruling against the executive order targeting six Muslim-majority countries. The Trump administration vowed to take the case to the Supreme Court with Attorney General Sessions stating that the court’s ruling blocks Trump’s “efforts to strengthen this country’s national security”. The courts to date have based their decisions in part on fake news while a liberal attorney at the ACLU said that if Hillary Clinton had put it in place it would be legal. Obama holdover Sally Yates who was acting Attorney General before her firing for not implementing the travel ban was told that the ban was legit but decided to play politics anyways. Leftist judges and their Mainstream Media (MSM) friends are doing all they can to call President Trump a bigot and shut down his travel ban in spite of the majority of Americans agreeing with the President. In early February we shared a post at the GWP arguing that the President would wait to take the travel ban to the Supreme Court until Justice Gorsuch was in place on the Court. The Supreme Court at the time that the first liberal court stepped in to block the President’s travel ban was made up of four far left liberal judges appointed by Democrat Presidents and four judges appointed by Republican Presidents. If a ruling at the Supreme Court ends in a tie, the lower court’s ruling stands. The President eliminated the probability of this happening by not taking the travel ban to the the Supreme Court until the opening was filled. If the liberal judges’ position has any merit and the law and legal responsibility of the President to set immigration policies is trumped by their interpretation of things reportedly said or actions taken by the President before or after being President, then why would the liberal judges not take into consideration the President’s meeting with 50 Muslim leaders last week who together with the President stood up against terrorism? Can the court take some prior actions into consideration and not all in basing their ruling on what the law states? If they could take into consideration their interpretation of a President’s prior positions or statements to interpret the immigration law then wouldn’t they have to take all actions into account and wouldn’t the actions last week trump all prior actions? The liberal judges in the US Courts should be impeached for such one sided, far left rulings, that don’t take the law into consideration but rather are based on their feelings and radical beliefs.